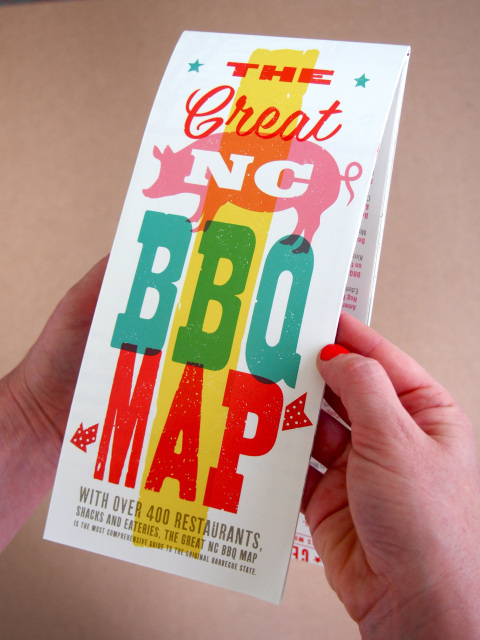 Hot off the presses is the locally grown, soon-to-be nationally known Great NC BBQ Map. I ordered my copy today and look forward to it soon taking its rightful place in my car’s glove box. Frankly, if this map had existed a few year’s ago, I would have never bothered with this website, as the website’s origin traces back to a similar idea that good ol’ Porky LeSwine was too lazy and untalented to execute! I should add that it’s particularly good to see entrepreneurs from NC take on the barbecue map challenge, given our mustard- and hash-loving neighbors to the south put the weight of their state government behind such mapping. With over 400 restaurants, it seems the Great NC BBQ Map map will cover most of the state’s outstanding barbecue places and a whole lot of other ones too. Porky LeSwine will probably make a lot of margin notes on his map to keep from getting tempted to detour toward too many generic gassers. Porky leswine should go visit Currituck BBQ located on the way to the OuterBanks NC from Norfolk not far from the NC/VA State lines. Have the small pulled pork sandwich or have 2 ,(don’t order the large as the bun has seeds on it usually) no slaw on it, the spicy vin sauce and some fried okra and fries. The best BBQ in north east NC. Then go try PigMans BBQ off Oceanacres drive and the highway, in Kill Devil Hills NC OuterBanks. Try a pulled pork sandwich with fries and slaw and ask for their bottled sauce on the side. Start with fried shrimp side if you are starving. yummy too. heck just ask siri to take you to both.